I’ve turned a couple small wood and plastic projects on my metal working lathe using metal cutting tools mounted in the quick release tool holders, but this restricts you to straight line cuts. If you were good with an EtchaSketch when you were a kid, should be no problem working the crosslide and carriage hand wheel at the same time to form curves and radiuses on a work piece. Give it a try. Always got the old noodle going Matt. My only concern is the cantilevered mounting of the rest. If you get into bigger objects it may become a bit springy. I don’t have a wood lathe because I have a metal lathe, I use a couple of pieces of tarp across the bedways to help keep dust from getting behind the carriage apron. I don’t know how to use the wood lathe tools-I don’t have any. I pretty much cut wood on the lathe using cutters shaped for cutting aluminum, and use the same methods cutting plastic or soft metal. That is a legit concern and one that I have as well. I made this using the shanks of long 3/4” dia. partially threaded bolts, and the rest is 10” long. It does spring a little, but most of that comes form 1/2” thick the aluminum block. I’m thinking about machining another one that is not as long, from 3/4” aluminum stock. I’m not so happy with using a metal lathe for turning wood. First, wood chips and dust will get into the workings of the lathe and compromise the accuracy. Second, the speeds are usually not fast enough for turning wood. I have a great old Sheldon metal working lathe, but for woodworking, I bought a wood lathe. I have on occasion, turned a piece of wood on the Sheldon, but I didn’t like the mess it made.There’s a saying; “use the right tool for the right purpose”. That I believe. 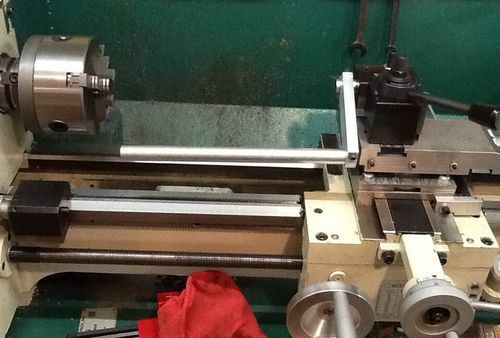 A metal working lathe is a precision machine and should be treated with respect. 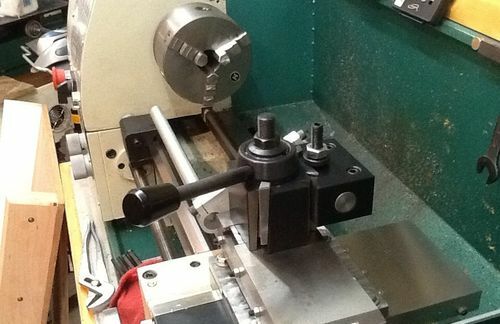 A metal working lathe is a precision machine and should be treated with respect. 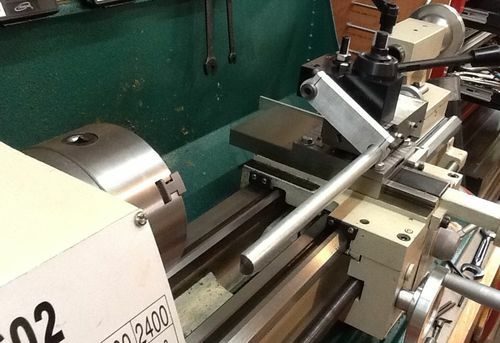 I don’t disagree with your viewpoint, but I have limited space and funds and wanted a metal lathe more than a wood lathe, and made sure that I chose a model that went up to 2,000 RPM…. that said, putting a bib around the saddle will go a long ways to keeping it clean and if I fall in love with wood turning, I’m sure I’ll go in that direction. Complete nonsense, with reasonable care a metal lathe will not be damaged by cutting wood. I often see amateurs making goofy statements like that. As-metal cuttings are nasty, sharp and hot. I totally agree…if wood dust hurts your metal lathe what exactly do you think metal dust is going to do to it? ? Let me say it another way, if a little bit of wood dust hurts your “precision” metal lathe then how much respect does it deserve ?? Gimme a break!!!! Wood chips/dust certainly won’t hurt a metal lathe… but mix that stuff with swarf and oil and it sure does become a mess! My only concern, aside from gumming up the lead screw, would be tannic acid in oak shavings causing rust.